Pinterest has grown to become a go-to place for anything inspiring. From DIY crafts, beauty, recipes, home hacks you name it it’s all there. It’s full of gems to be discovered. And if you’re into photography or specifically infant photography you could also find tons of inspiration for that. Like cuddly babies cozily wrapped in a blanket or something more fun like babies dressed up in adorable costumes. It looks easy to do but when amateurs tried to recreate it, they might have forgotten that a professional was hired. 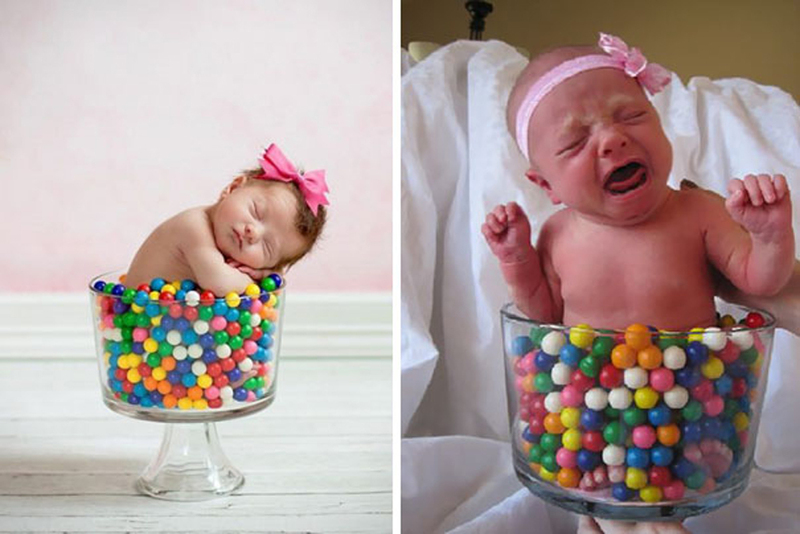 But despite the flop, we could enjoy laughing out loud at these Hilarious Pinterest Baby Photoshoot Fails That Will Drive You Insane. Hashtag expectation vs reality. Hopefully, the grandparents won’t have a heart attack when they see these. 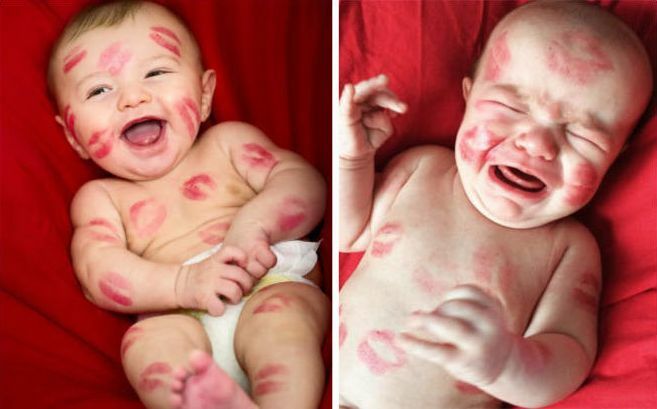 As much as we would like to smother our yummy babies with kisses all over and leave kiss marks sometimes our babies just don’t enjoy them as much as we do. Just like this baby who was murdered with kisses all over. He probably woke up on the wrong side of the bed but the parents still insisted. Now he’s letting everybody know that this wasn’t a fun idea. It looks like these two babies are having the time of their life sucking on the Christmas decors. They still couldn’t appreciate what Christmas is so they’d rather nibble on the decorations and have their own definition of fun. Hopefully, baby munching on the lights won’t toast her mouth. This baby may look warm and cozy but it looks like she has other things in mind. Lik spitting up some milk. She may be too anxious to be in front of the camera that it made her tummy upset. Well, now we know she’s not having any milk before her photo shoot. When we think about nice things it’s often about babies and something sweet. Because who doesn’t like sweets and candies, right? We’re not sure if the baby is crying because of the gumballs or she feels cramped up in that glass container. We’re just hoping everything is free from wee and poo. That would have been a waste of gum balls. It looks like someone is having a bad day. This baby is definitely going to explode anytime soon. His face looks like a grumpy old man who needs to be attended to asap, or else. 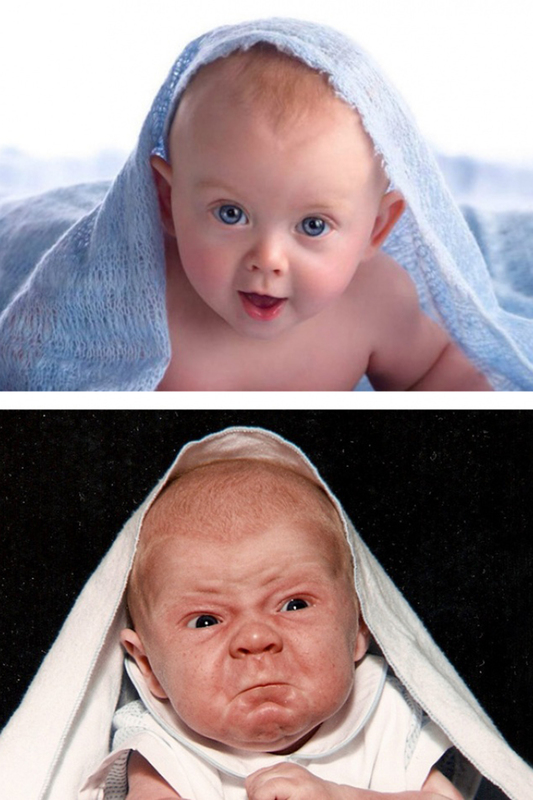 Or maybe he’s not happy that he doesn’t have the same blanky as the Pinterest photo?